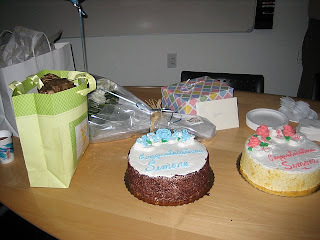 My friends and co-workers surprised me yesterday with a baby shower. My boss first had a meeting with me in a meeting room to distract me. Once we were on our way back to our desks she said wait one sec and opened another meeting room door and SURPRISE! It was so nice of everyone to think of me and baby. I got some beautiful flowers and gifts and TWO yummy cakes! But I must admit I turned bright red with all eyes on me. I kept telling people to sit and relax! Luckily my friend took some pics so these are also the latest belly shots. Tomorrow I start my 34th week. Yikes! 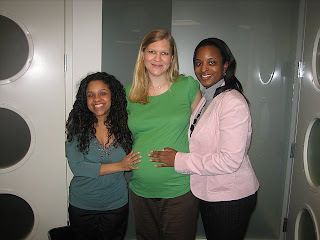 We are registered at buybuybaby and target. I hope you can visit sometime this year! Awww-- my little monkey neice/nephew!!!! Baby showers for youuuuuuuuuuuuuu!